UNIVERSAL CITY, Calif. (AP) — Although Zlatan Ibrahimovic’s first season in Major League Soccer was a smashing individual success, his LA Galaxy were a serious disappointment in the standings. The Galaxy’s failure to make the MLS playoffs is a major reason why the Swedish superstar is back for another season in California instead of taking big money to return to Europe. The 37-year-old Ibrahimovic scored 22 goals in 27 games after joining the Galaxy in March. He added 10 assists and dazzled the North American league with his offensive skill, which hadn’t been diminished by his recent knee injury. Although he led one of the most prolific goal-scoring teams in MLS, the Galaxy struggled defensively and in big games. They finished in seventh place in the Western Conference with a 13-12-9 record despite Zlatan’s steady scoring. Ibrahimovic had little doubt he could score goals against MLS defenses, but victories weren’t as simple to acquire. After proving he is still a force up front, he wants to lift the Galaxy’s entire roster this year. Ibrahimovic also got a new one-year contract paying him much more than last season, when he made a meager $1.5 million. 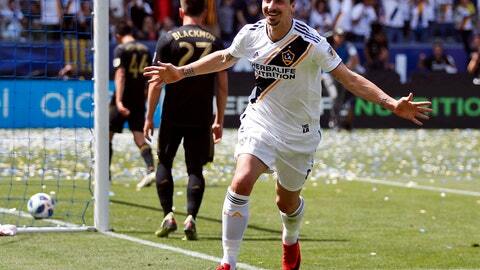 Zlatan agreed to the smaller initial deal to fit into the strictures on the Galaxy’s payroll imposed by MLS’ salary cap, but his new deal is more commensurate with his abilities. Ibrahimovic said he could have signed a multiyear deal with the Galaxy, but declined. The five-time MLS Cup champion Galaxy are returning with much the same roster, but they will be led by new coach Guillermo Barros Schelotto, the former Boca Juniors boss, and new general manager Dennis Te Kloese, the former Mexican national team executive. Although Ibrahimovic got along well with his first Galaxy coaches — the late Sigi Schmid and interim coach Dom Kinnear, who returns as an assistant to Schelotto — he supported the decision to hire the new Argentine coach. Ibrahimovic returns as the biggest name in MLS, which has balanced its usual lineup of over-30 European stars with a wave of younger talent from South America. While the likes of Argentina’s Gonzalo Martinez and Peru’s Marcos Lopez should continue to raise the overall level of competition, stars like Zlatan, D.C. United’s Wayne Rooney and the Chicago Fire’s Bastian Schweinsteiger are keeping the world’s eyes on the league.